The songs you play in Ocarina of Time can be split into two major categories, warping and non-warping songs. I thought it might be interesting to explore the non-warping songs. These songs are: Zelda’s Lullaby, Epona’s Song, Saria’s Song, The Sun’s Song, The Song of Time, and The Song of Storms. They command passageways, change the will of creatures, control the elements, and even conquer time itself. Of these six songs, they can be broken down into two other categories that I call “friendly” and “elemental.” The friendly songs are Lullaby, Saria’s, and Epona’s, and the elemental songs are Sun’s, Time, and Storms. Which of these six songs is the most useful in the game? Which one is the most useless? Which one is the most powerful? Take the leap inside to find out my thoughts and have an opportunity to share yours. Of the friendly songs, I think that Saria’s song is the most useless song of the bunch. Other than the one heart piece you obtain with it, cheering up Darunia and convincing Mido you’re a friend of Saria, I never use this song. Navi gives enough annoying advice and hints that speaking to Saria is unnecessary. Zelda’s Lullaby is probably the most used (maybe over used) in the game, does that make it the most powerful? I don’t think so. I think it just has the most authority. Epona’s Song is helpful to call your horse to ride on, and to get some milk if you happen to find a cow. This is useful, but you could get through the whole game without Epona if you just wanted to walk. I love using Epona though, so I frequently tend to use this song. Of the three “elemental” songs, it is hard to say which is the most powerful. The Sun’s Song can be used defensively if you don’t want to fight Stalchildren in the field at night or wish to escape being violated by a Redead. 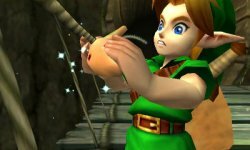 The Song of Time is used almost like the Cane of Somaria in A Link to the Past, creating and removing blocks to solve puzzles. However, this song doesn’t create a block whenever you wish, only where one is predetermined to exist. The Song of Storms is my personal favorite. I think it’s cool when it tears dirt from the ground revealing a secret hole. So what do you think? Which one of these songs is your favorite? Do you agree with me that Saria’s song is almost useless? Is it more powerful to command the sun or wield the power of storms? Do you think Zelda’s Lullaby is over used in the game? Let me know in the comments below.